I usually post once a week, but you may have noticed I’ve skipped several weeks recently. There are a number of reasons for that, but the primary one is this: I haven’t had anything new or interesting to say. My recent series of Best Decisions posts was well received and gave me the opportunity to revisit some of my best posts from my time blogging at So Much More Life. I’ve probably made even more good decisions than I wrote about, and I’ll mention those to you when they come to my attention. 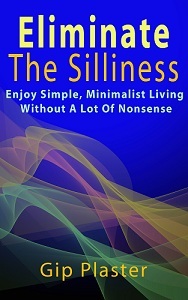 There are also lots of topics related to simple, minimalist living that I haven’t visited. I’ll get to those some day — when the mood strikes me. In addition, I’ve been writing a lot for other projects, trying to stabilize my income and get my financial life moving in the right direction again. After writing articles and posts all day long, writing another one for this blog — especially when there’s nothing particular on my mind — doesn’t seem appealing. Of course, I also realize that fewer of you are reading in the summer. There are lots of things to do outside, perhaps with others who are important to you, that come before reading another blog post from one of the many voices suggesting that you to live more simply and enjoy your life more than ever before. rehashed something I wrote before. written a thin post with links to lots of old posts. rambled on about a topic that’s not quite, uh, on topic. I respect you enough to keep quiet when I have nothing to contribute to the conversation. And for that reason, I think I’ll leave this at that. Have a great summer. I’ll be with you when my simple, deliberate life doesn’t call me elsewhere — and when I have something to say. I was mildly concerned, though, because you weren’t responding to comments — you’re usually right on top of those — but then I thought maybe technical glitches. Yeah, summer blog slump, I guess. Traffic, and especially comments, tend to wane a bit this time of year, for me anyway. Yes, all is well. I’ve just been busy — and as I said, I don’t have much to say. Things will circle back around for me in a few weeks, but I wanted to offer an update on why I’m silent until I get talkative again! Good to hear from you, Linda. I have a “someday” pile also, but I’m done all the easy ones. I’ll get started on some others as soon as I feel I can do a good job with them. Nice to see you back, Gip. I’ve been a little dry over at The Best 50 Years, too. On the positive side, it’s given me the opportunity to share some “words of wisdom” from others, which I’ve decided adds a little value for my readers without being lengthy. Have a great summer! Thanks, Crystal. Summer begins today, and I’m expecting to have a good one. I feel that things are falling into place for me, and I’m certain to be blogging about that in the coming months. Thanks for letting us know. I’ve had to revert to an old laptop until I can afford to get mine fixed. I thought it was this old thing I’m using. Also, my mom had a stroke in May and I was very busy then. Glad to see you are fine. I’m still trying to catch up on all my emails from using this old, very slow computer. I agree, better not to write at all or to write just for the heck of it. Have a good summer. I’m sorry to hear you are having problems, Joni. I hope things all resolve themselves in the best ways possible. These comments are encouraging me to pay more attention to this blog, so I may be back to my regular schedule here sooner than I expected. We’ll see. It’s really nice of you to think of your readers. May we all have a great summer! Thanks, Eunice. Thanks for joining the conversation. I know whenever I want to read a blog post about bettering my life, you will be there. If you don’t write every day or even every week, fret not; for your blog is part of a betterment category in my RSS reader. You will always be in the same place, with or without a new post. And when you write something, such as right now right here, I will respond with a comment when sparked. Welcome to the club, Gip, by the way. I’ve been blogging less and less, too. Thanks, Ari. I’m not exactly intentionally blogging less, but a summer slow-down is nice. I’ll be back at it full force soon, I’m sure. Thanks for commenting, Jo. Better late than never! Since this is still the current post, I don’t guess you’re really late. I’ll be back soon, I promise. It was very kind and considerate with you to do so. With a lot of crap we get to read in the web nowadays, I guess the best solution is to do what you are doing now; stop writing when you have nothing worthwhile to share.